Of course Islay does get a few mentions, otherwise I wouldn't be writing this entry. A high level overview gives a summary of the scene and related books. A list of locations includes The Celtic House in Bowmore (described as ‘Bookseller of fiction, Scottish interest, history, whisky-related and children's titles’) as well as various places on the mainland. Drivers to Islay will pass through Gairloch, partial location of one of my favourite books, The Crow Road by the late Iain Banks. For the books there's a number of listings, mainly whisky and history related books. But Baba King Of The Castle & Jacket Potato by Mary McGregor also receives a mention. 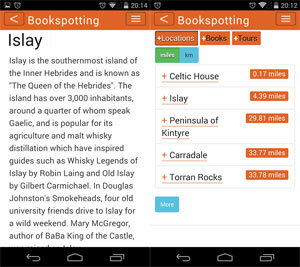 Hopefully further books by AILSAPRESS will also be mentioned in future updates of the app. If you're interested in the app, you can download it from the Apple iTunes app store (for iPhone) and Google Play (for Android). Credit to the Scotsman crew who added the links to their report after my earlier complaint that they hadn't provided them initially.